Plant-parasitic nematodes are one of the most destructive agronomic pests. During several decades, the control of this pest on agricultural crops has depended on chemical pesticides. These chemicals are very toxic with high potential to pollute the environment. Nowadays, the search for substitute products has become a priority. In this sense, the biological control agents have arisen as an environmentally friendly alternative. Different rhizobacterial strains are able to control nematodes improving plant health through the production of secondary metabolites. 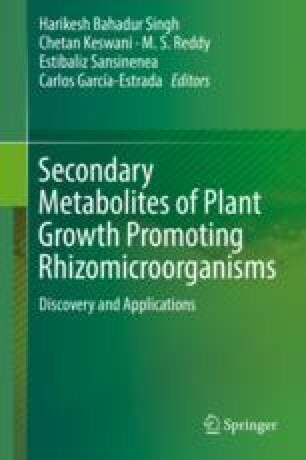 The aim of this chapter is to review the secondary metabolites produced by rhizospheric bacteria involved in the control of plant-parasitic nematodes. The use of these compounds could help to overcome the problem related with the survival of the biocontrol agents when introduced in new ecosystems. In the same way, the study of the metabolic pathways that lead to the production of these compounds can help to discern the conditions to trigger their production and its consequent activity in the rhizosphere.